After I made my grey ombré handwarmers, I wanted to make some mittens with that same sort of changing grey feeling, but not exactly the same. The stripes give a sort of a modified ombré effect moving from grey to dark grey to cream. I really like the way they move from color to color and the different widths of the stripes. The colors remind me of the skies on a wintery day, thus the name. 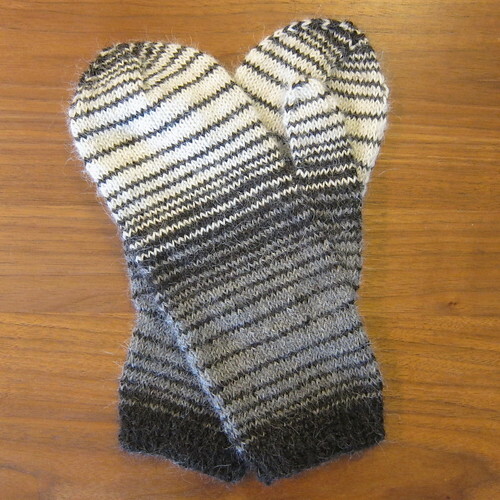 The mitten itself is a pretty basic mitten shape. The yarn I used, Frog Tree Sport Alpaca, made for a soft, fuzzy, delicate (rather than bulky) mitten. I did a short 1-inch cuff and then started the stripes down on the wrist. Usually, I do a long, 3-inch, ribbed cuff, but I really like how this shorter cuff looks and fits. 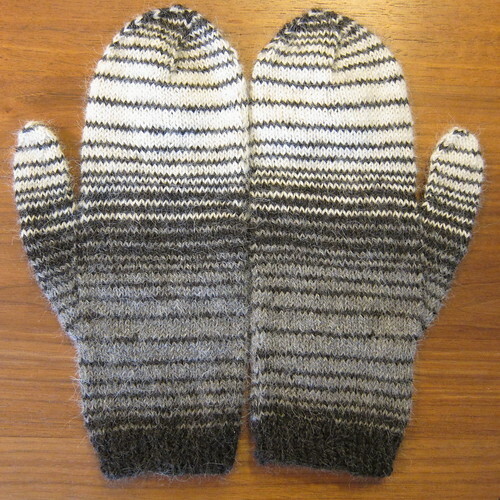 What makes these mittens is the interesting stripe pattern, a chart makes it easy to follow though. Download the Winter Skies Mittens Pattern and Chart together or just the Winter Skies Mittens Chart. Follow the pattern for construction details and the chart for the color changes. 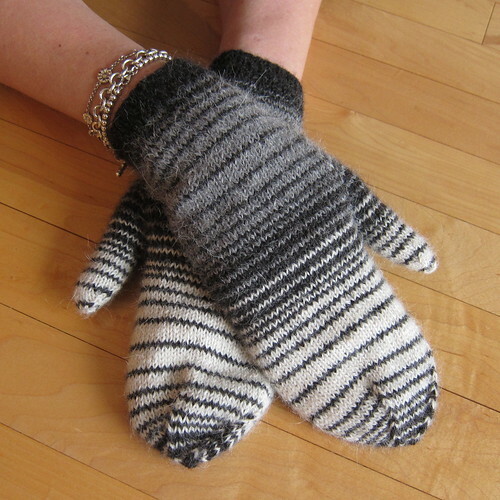 Size: These mittens are a women’s medium, approximately 7.5 inches around. Sport weight yarn, I had a 130 yard balls of Frog Tree Alpaca Sport in dark grey, grey and cream. I used about 2/3 of the dark grey and 1/2 of the light grey and cream. M1r – pick up the bar between the last stitch you knit and the one you’re about to knit, bringing the needle from the back to the front. Knit into the front of this stitch, increasing one stitch. M1l – pick up the bar between the stitch you knit and the one you’re about to knit, bringing the needle from front to back. Knit into the back of this stitch, increasing one stitch. 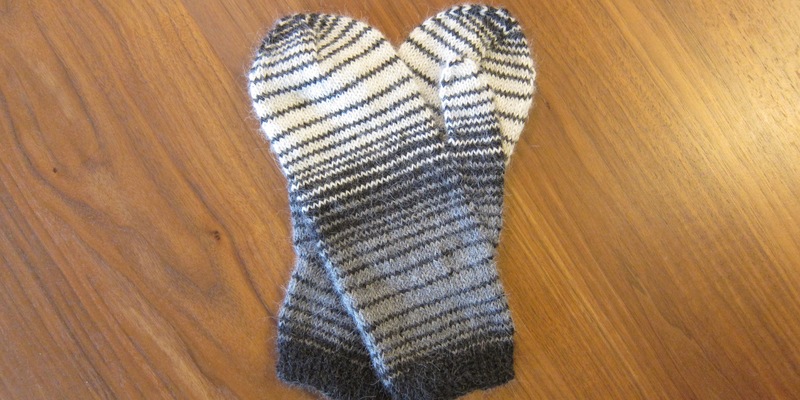 I used this method on these mittens every time I had a stripe of more than one round. Unfortunately, it only works when your stripes are longer than one row. I have not found a good way to fix the jog problem with single row stripes. With darkest color, cast on 56 stitches. Divide between three needles. Join together, being careful not to twist, and place a marker between the first and last stitch to mark rows. Remember to follow the chart for color changes. Cut tail and weave through 4 remaining stitches. Pull the tail inside the mitten and tighten. Weave in ends. Put the 21 stitches on the stitch holder on three needles. 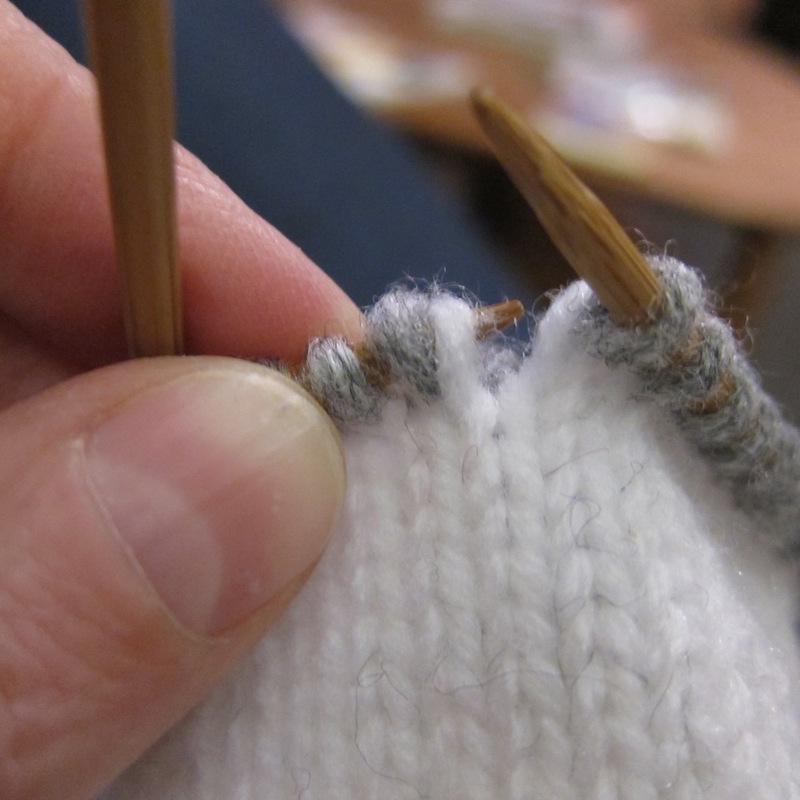 Pick up two stitches from the hand placing a stitch marker between them. Cut the yarn leaving a 6 inch tail and weave through the remaining stitches. Pull the tail inside and tighten. Weave in ends. Very nice! Will you take them skiing?